Irrigated crop production has drastically altered the hydrological attributes and groundwater flow patterns of the San Joaquin Valley especially in the Westside. The leaching process flushed out trace elements such as Se, B, As, and U contained in marine sediments from the Jurassic to Miocene periods that were deposited in the surface soil layer. Pumping of groundwater lying deep in confined aquifer resulted in severe land subsidence. Water made available through inter-basin transfer expanded the irrigated acreages. By the time, selenium poisoning of birds and fishes took place at the Kerstersen Reservoir, salinity drainage has become an issue requiring immediate and long term solutions. The author acknowledges decades of productive collaborations of his colleague, N. T. Narasimhan. This work started as an educational exercise on the part of a hydrogeologist (T.N. Narasimhan) and an earth scientist and water resources engineer (N.W.T. Quinn) to synthesize our understanding of the important technical issues pertaining to irrigated agriculture on the Westside of the San Joaquin Valley. Because of the breadth of the technical questions involved, much new material beyond our areas of expertise was digested. We are indebted to the following for thoughtful, critical reviews of the first draft of this manuscript: James E. Ayars, John Fio, Wilford R. Gardner, Mark E. Grismer, Edgar A. Imhoff, Keith C. Knapp, John Letey, Theresa Presser, J. van Schilfgaarde, Donald L. Suarez, K.K. Tanji, H.J. Vaux, Jr. and Wesley Wallender. We are thankful to Manucher Alemi, Kenneth Belitz, Sally M. Benson, and David Zilberman for constructive criticisms of the revised manuscript. 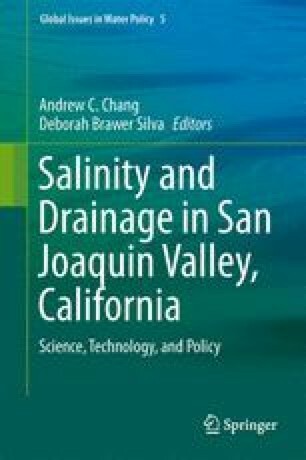 This work was partly supported by the Salinity and Drainage Task Force of the University of California and partly by the Regional Research Funds of the Agricultural Extension Service. Kratzer, C. R., Pickett, E. J., Rashmawi, E. A., Cross, C. L., & Bergeron, K. D. (1987). An input–output model of the San Joaquin River from the Lander Avenue bridge to the Airport Way bridge, Appendix C of San Joaquin River Basin technical committee report: Regulation of agricultural drainage to the San Joaquin River (State Water Resources Control Board Order No. WQ 85–1 for cleanup and abatement of Kesterson Reservoir, 173pp). Sacramento: California Water Resources Control Board. http://cdm15911.contentdm.oclc.org/cdm/compoundobject/collection/p15911coll2/id/688/rec/16. Accessed 20 June 2013. SJVDP (San Joaquin Valley Drainage Program). (1990). A management plan for agricultural subsurface drainage and related problems on the Western San Joaquin Valley (183 p). Sacramento: The San Joaquin Valley Drainage Implementation Program, Department of Water Resources. http://www.water.ca.gov/pubs/groundwater/drainage_reuse_final_report_san_joaquin_valley_drainage_implementation_program/03-reuse.pdf. Accessed 20 June 2013.